Posted on June 14, 2017 , in Hot Tubs. The blazing heat of summer and the frigid cold of winter can be equally damaging to your hot tub, so knowing how to keep your hot tub safe during extreme temperatures is crucial. Below you’ll learn what you can do to protect your hot tub from extreme weather to keep it in great shape. When the weather is cold, winterizing your hot tub is the best way to protect it from damaging cold and ice. 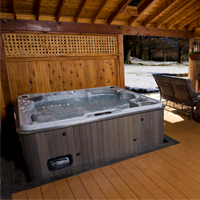 Before cold temperatures arrive, use a shop vac to drain your hot tub including the fittings, air blowers, and jets. Any water left in the hot tub can permanently damage it, so make sure you put on the cover and strap it down after you drain. This will prevent debris and snow from getting in the hot tub. Sun can be extremely damaging to your hot tub, especially to the cover. Make sure to keep your cover out of the sun to keep it from growing brittle and developing cracks. It’s also a good idea to invest in a UV protectant cleaner and applying it every few months. Always choose a protectant that does not contain alcohol or petroleum. Strong wind and storms can cause problems because they stir up debris that can end up in your hot tub, clogging the filter and causing mechanical issues. By locking your cover, you’ll keep it tight even during strong winds and keep your hot tub clean. With these simple steps, you’ll be able to protect your hot tub even in extreme weather. To find out more about our variety of hot tubs, download our buyer’s guide.